The Notes app in iOS now allows you to draw, sketch, and color, using your finger or a stylus on the touchscreen. 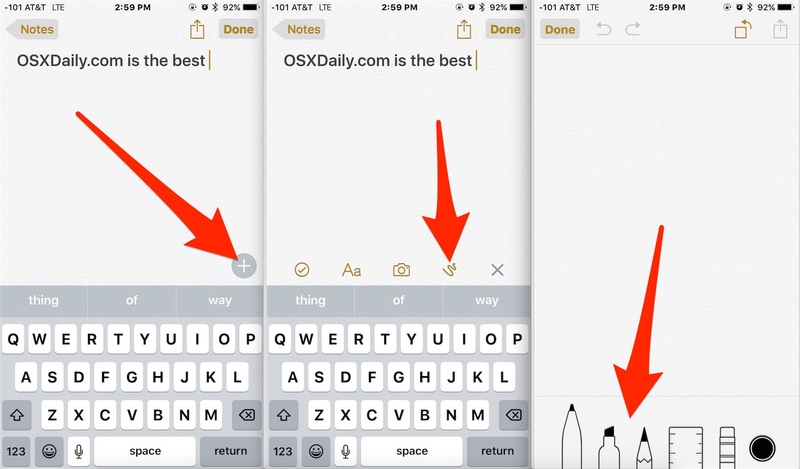 This is a really fun feature that is quite well done, and you’ll find the Notes drawing ability is particularly great on the larger screened iPhone and iPad models, but it works well on the smaller screen iPod touch and iPhones as well. To have access to the Notes drawing tools, you’ll need iOS 9 or later installed on the device, and beyond that it’s just a matter of knowing where to look and how to use the feature. You can either start drawing immediately, or add a sketch after you’ve already entered text, and it doesn’t matter if there are images or styling inserted into the notes either, the drawing feature will always be available in Notes. The tools available in Notes app drawing mode are; pen, highlighter, pencil, ruler, eraser, and color picker. You can change the color of any of the drawing tools, and the ruler also works with any of the sketch tools to draw straight lines. Troubleshooting Drawing / Sketching in Notes app: If you don’t see the drawing tools available, it’s possible that you’re using iCloud Notes rather than on-device Notes. You can quickly switch from the primary Notes app screen by tapping on the < Back button in the upper left corner, and choose 'On my iPhone' or 'On my iPad', then create a new note from there. I'm able to create drawings and sketches on both iCloud and on-device notes, but some users appear to have a limitation to on-device notes only for an uncertain reason. You can also save a sketch or drawing you created in Notes app if you want to by tapping the little sharing arrow icon and choose “Saving Image” – and no, even though Notes app has a skeumorphic textured background, that texture is not saved with the drawing, the sketch will save against a white background into your camera roll. For those wondering, a drawing saved from Notes app on an iPhone Plus will save with a 1536 x 2048 resolution as a PNG file. You can click on the example image below (which has been converted to a compressed JPEG) to see a full sized sample of a lovely sketch image made in Notes app, as you can tell I did not do well in art class but sometimes it’s the effort that counts. This is a fun feature to play around with, and it’s obviously going to be useful as well, whether you’re artistically inclined or artistically challenged doesn’t really matter. 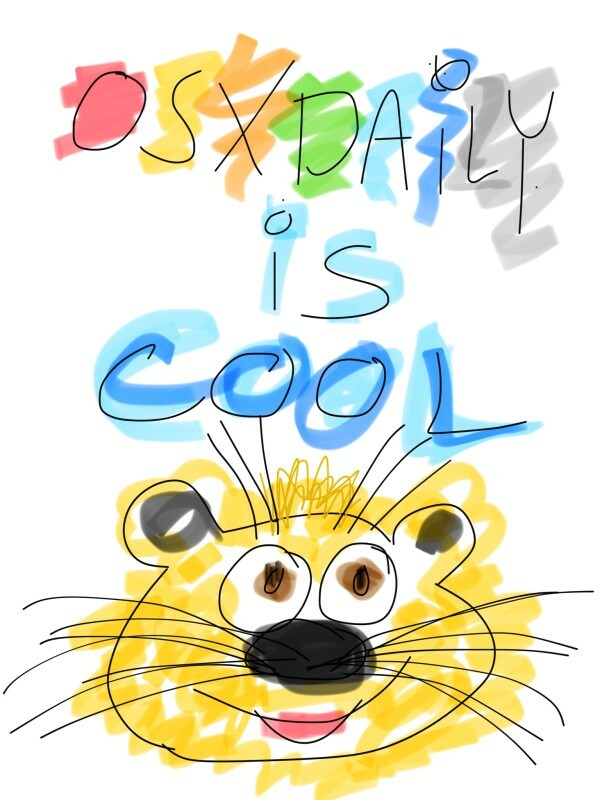 After playing with the Notes drawing feature for a while, it made me wish there was a similar drawing tool built into the Messages app of iOS, since it’s definitely fun to draw silly sketches and send them to your friends and family. For iOS users with a Mac, you’ll find the drawn notes sync just fine to the OS X Notes app too, further extending the use of Notes as an iOS to OS X clipboard feature of sorts. Not available on my iPhone 4S, and most likely not available on iPad 2. I have an iPhone 6. I have 9.0.2 and It is up to date as of today. The plus in the corner is not in my notes. Is there a setting to set it up? Maybe only on the 6s or 6s plus? I have iOS9.0.2 on my iPad Air 2 and the Notes app has no bottom bar where the “x” and others are supposed to be. Its there.. you have to select the notes on my iphone – not the notes in the cloud – or notes for exchange ..
You may need to “upgrade” your notes. If you’re in a note, click Back, then back again (mine was labelled “Local Notes”) – then I saw an “upgrade” button – clicking that made all the new tools available. This is the solution to the problem everyone is posting here – please read this and try it! Although I’m not positive about resizing a drawing after it’s done, I did insert a photo and it ate the whole page. It would be nice if it could be resizes to what ever size is needed. Like a pix of a food item on your grocery list doesn’t need to be full sized. I will submit to Apple and maybe they will address. there is no plus sign above the keyboard? Now this helps!!! Thank you so much !!!! If your Notes page is blank, no “X” will appear. Tap on the squiggly line at the bottom of the Notes page to bring up the drawing tools. Not an option on my ipad2 with iOS 9.0.2, I have an iCloud and personal account in my notes app and they have slightly different options, but neither allows me to do sketches as described above. I found that the drawing tools only show if you are creating notes when you are in On My iPhone mode. They aren’t available when you are creating notes while in iCloud mode. In the upper left corner of the Notes menu bar click left till you are on the Folders screen. Then choose the Notes under ON MY IPHONE. I have iphone 6 and upto date 9.0.2. I have also that issue. There is no + plus above the keyboard? Is this a trick to get + sign? The drawing tools are in Notes app, follow the instructions to show them and use them. More exclamation points doesn’t make a difference!!!!!!!! You must have iOS 9 or later. Wasted lot of my time trying to find “x” even search in settings on both my iPad2 and iPhone4S (both updated to 9.0.2). I wish the author had made sure if this feature is available to all or had mentioned device and OS requirements. 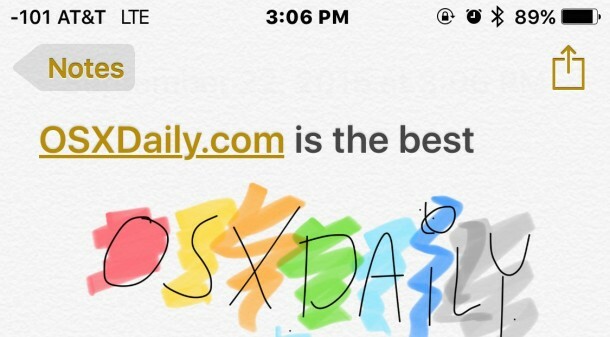 Sketching in Notes is a feature for iOS 9, it works on all devices that have updated. There are no system requirements beyond that. I have an iPad 3rd gen with iOS 9.0.2 installed. I touch the left arrow and select notes on my iPad. I then click the new note icon. The only tool I see is the camera icon, no squiggly line. Apple does not mention that this feature is for all generations of products. Please don’t spread information when you have obviously not actually tested all devices!!! Thank you tellier, so easy when you know the correct route. Sketching with Notes app is available on all devices that can run the new versions of iOS, it is not limited to a device. See the troubleshooting note in the article, it’s possible you are using iCloud Notes rather than on-device Notes, which seems to limit the feature for some users. THIS IS THE TRICK! All your devices need an upgrade to the latest, even your computer to el capitan. I don’t want to el capitan yet so this won’t work until I do. I have a brilliant idea (in my humble opinion). Every person who has said that the squiggly line appears on their device has NOT told us what device they are using. I am using an iphone 4s upgraded to iOS 9.0.2 and there is no squiggly line after I tap the round plus sign. But I do see 3 icons where the squiggly line should be: (1) a checkmark inside a circle, to create a checklist (2) a capital A and a small a like this “Aa”, to add formatting and (3) a camera icon, to add pictures. Three of us commenters using an iphone 4s truly cannot make the squiggly line appear. My brilliant idea is: If your device shows a squiggly line please tell us what device you are using. When you press on the empty space between camera and X sign, it asks to insert a photo or make a photo or cancel. In response to vab: YES, you are seeing EXACTLY what I see. If sketching is available on an iphone 4s, someone will have to lead us through the steps to enable it. Until then, I am going to assume that sketching is NOT available on all devices. Sorry tellier (see his previous comment). The Drawing and Sketching feature are not limited to any model devices. If you are not using on device notes, and have not updated iCloud, you won’t have the drawing tools. Everything upgraded to latest iOS and El Crapitan. This feature does not work. Just more Apple using the public to do their development rather than actually have developers do it. Jane, you said you have the squiggly line on your iphone. Please tell me which iphone you have. OK, so far Paul, steve, tellier, Big Cat Man Guy, RP, Shirley Hershey, crs, shawn, and Jane have all said that they have the squiggly line on their devices but not one of them has mentioned what SPECIFIC device they have. How can we figure this problem out if nobody will tell us this important information? I myself have an iphone 4s, and I need to know if anyone in the universe has an iphone 4s AND a squiggly line. I think this is really a bug in iPhone 4S and the empty space may become the drawing icon. I also do not have the squiggly line. I have I iPod with 9.0.2 and upgraded Notes. I do have the camera, fonts and check box icons, but no squiggly line icon. My iPhone and iPad do have the squiggly line icon. Hi, drawing tools are fine, except when it comes to using the rule. The rule will only draw diagonal lines in this ‘\’ orientation. Any clues as to changing the orientation of the rule would be helpful. On some devices, there is no + symbol; I have an iPad Air and I have a white bar at the top of my keyboard – drag that up and you will have all the editing tools. The confusion for me was that I had the squiggly line and the camera icon at bottom right when I created a new note but not the others – I assumed the other tools should display in the same place. Nope. I had to find the white line above the keyboard. Now I have the squiggly line and camera icon at bottom right and in a toolbar above the keyboard. I’m just happy to have found them! That is it! Drag up the white line on the top of the keyboard. Took a couple of tries to make it happen. Using iPad with retina display. It is the QuickType bar, which I didn’t know was added in iOS 8.
ok, vlm reports that the squiggly line can appear on an iPad Air. Can anyone else tell us another device that the sketching tools work on? I figured out how to find the missing plus sign that allows you to have the draw and insert photo feature. The key is that it only is available on the “on my iPhone ” feature. Here is how to find that. 5. Under the folder ON MY IPHONE crest a new note and you will see the + . 6. Click on the plus and the draw…. Features show up. 7. If you have other previous notes , the features will not show up unless you copy each not into that specific on my iPhone folder . Typical. They, in the computer world, never tell you what a device won’t or can’t do. So you waste hours trying to make it work only to find out it will never work. I draw in Notes everyday with my iPhone. So, for you, you are the problem. Typical for people who refuse to read directions. 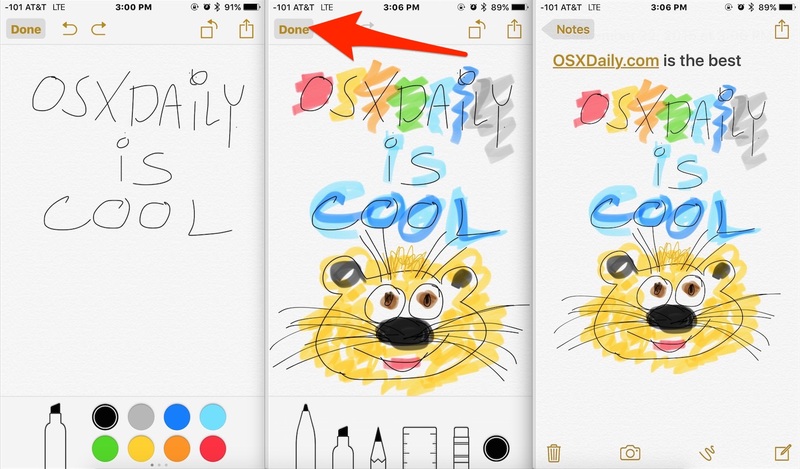 But if you actually read the article you’ll see that you can use drawing tools with every iPhone, iPad, or iPod touch that runs iOS 9.0 or later. That’s any device, with any iOS, that supports 9 or newer. The article even tells you exactly how to do it, with pictures and descriptions. But you know, if you aren’t going to read it, you won’t figure it out. I have an iphone4s updated to 4.0.2 and I can´t see the drawing tool. Nothing about the drawing tool. I have iOS 9.1 and trust me there is no (+) button to start drawling. Why won’t it show up? The drawing tool is a useless feature in my opinion. Being an iphone user for almost 6 years, I would have expected much more other than a sketching tool. – In my opinion, the note 5 beats the iphone by leaps and bounds. From screen resolution, Speaker Volume, an incredible writing tool (pen) that eliminates having to rub your fingers all over the screen. Apple should create a pen that allows their users to write quick messages instead of having to “type”. Understandably, not everyone uses their phone the same way, but when spending this much money on a hand held device, the device should have a simple feature such as a pen available for its users. I had a Note 5 sent to me for a trial use. The concept is great !! There are still some quirks in my opinion and cons, such as its large size, small keyboard screen & having to switch through keyboard screen types in order to use the pen as a writing tool is also annoying. If Iphone had a writing pen & it was easy to access + use when needed, they’d clobber every market out there in my opinion. The solution actually is in the settings Menu, it’s not so much an issue of having to “upgrade” your notes but the default note storage area. 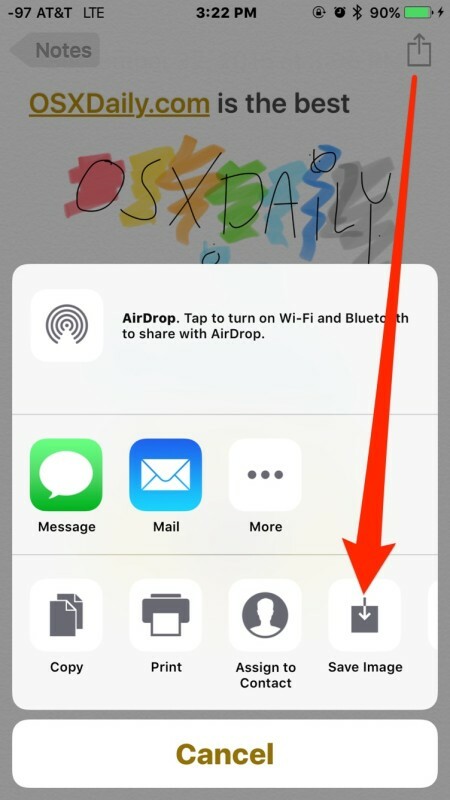 If your settings have either an email account or iCloud set for default notes then sketching tools do not show up, however by enabling “on My iPhone” or “on My iPad” and making sure the default storage area is listed as that local folder then the + icon will appear and sketch tools will be visible. (tested this both on the iPhone 6 and first-gen iPad Mini), hope this helps. Hi, may I ask if it is possible to save a copy of a drawing on notes and then rework it, save that copy and ‘rework it again? I see the copy icon but then can’t ‘paste it..
Is there anything similar to this on the Macintosh version?